It's time for a GIVEAWAY! I am joining with a great group of music teacher-authors to brighten someone's spring with $50 Teachers Pay Teachers gift cards. Actually there will be 2 winners! I love finding new music stores on TPT. Each one has some concept or activity presented in ways that I never thought of. Our students benefit when we explore new teaching materials and techniques! 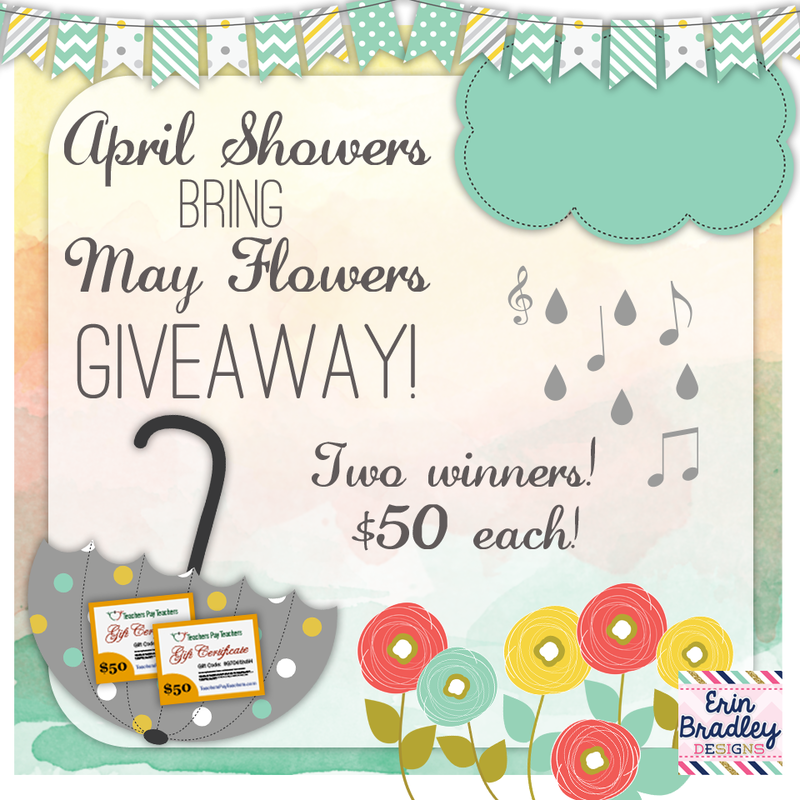 We hope that you will visit each of the links in the Rafflecopter and find some new favorites. The list of music stores represented in this giveaway is long, but your extra work could have a large pay off. Enjoy your journey and may you find musical flowers at each stop! I am linking up with Mrs. Miracle's Music Room for Worked for Me Wednesday. Do you ever just need a minute? A minute to get yourself together before beginning the next class? Or, a minute to find that set of manipulatives that you buried on your desk? Or, a minute to calm down a child who is came in the room in a grumpy mood? I do. All the time! Executive Skills are the skills that we use to be great singers. They are all of those things that we tell our students regularly, like stand up tall, inhale deeply from your diaphragm, feel your breath belt. Executive Skills also include mask awareness and vocal placement. Practicing these skills often happens at the beginning of a class or rehearsal. How does this help to give me a minute? Automated PowerPoint shows to the rescue! Each one of the executive skills is demonstrated with animated clip art to lead students in their vocal warm-ups. When I first introduced these slides, I definitely stood at the front of the room and demonstrated or explained each slide. Now, the students can complete the whole thing without my help, allowing me about 3 minutes to take roll, or deal with an unhappy child, or just breathe along with the students. My friend Chandra gave me this idea, and it has worked so well that I have created one or two different sets for each month of the year. I change the music and the clip art to reflect the season or holiday of the month, and I change an activity or two so we are not always doing exactly the same thing. I have use these successfully with every grade from 1st through 5th. However, now that I have been doing this activity for several years, my 5th graders this year are much less engaged. That is my next project: find something engaging for 5th grade to do at the beginning of class! 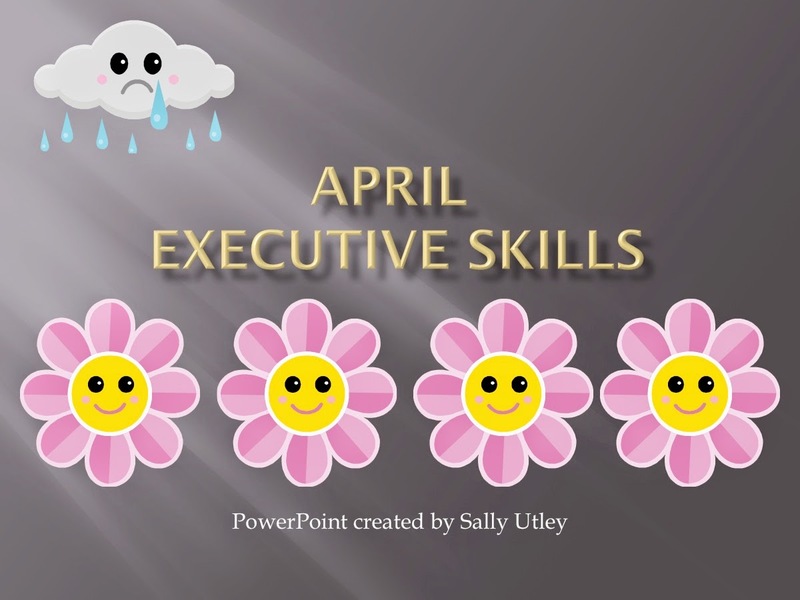 Click on the link below to download my April Executive Skills PowerPoint. Check out the notes view for hints on how to use each slide. The animations will only work in Presentation mode! UPDATE: Several folks had trouble getting the sound file to play. I have now included the actual sound file in the download. Save it into the same folder as the PowerPoint. If the embedded file still doesn't play on your machine, reinsert the sound file on slide 3. Directions are on the Notes page for slide 3. 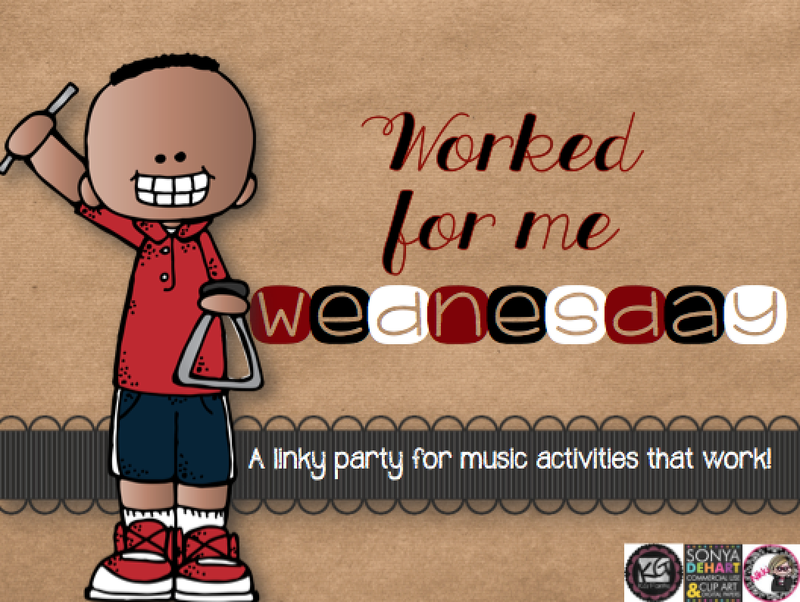 For more ideas that work for real music teachers, follow the Worked for Me Wednesday link or click on the picture at the top of the page. My students and I have been on spring break this past week, so they will have lots to share about their Easter activities when we get back to school on Monday. What a great time to capitalize on their excitement in a musical way. Of course we can't get through the week after Easter without getting out the egg shakers! Because the egg shakers have a quiet, swishing sound, everyone can have one at the same time. I purchased enough of the plastic eggs to make a class set one year when they were on half price. I filled them with a small quantity of plastic pony beads from the craft store. I chose to use beads instead of rice or barley (as suggested in most online how-to tutorials) because my school has had bug and mice problems in the past. The problems are gone now, but I do not want ANYTHING resembling mouse food to be stored in my classroom! While it is easy to make your own egg shakers, I am sad to say that nothing that I have tried (super glue, hot glue, pretty vinyl tape, masking tape) will actually guarantee that the eggs won't pop open. :( Send me your suggestions in the comments! My solution is to have a short discussion about how to be a great community member. Would community members try to peel the tape and pop the eggs open to ruin them, or would they try to keep the tape pressed down to keep the eggs closed? 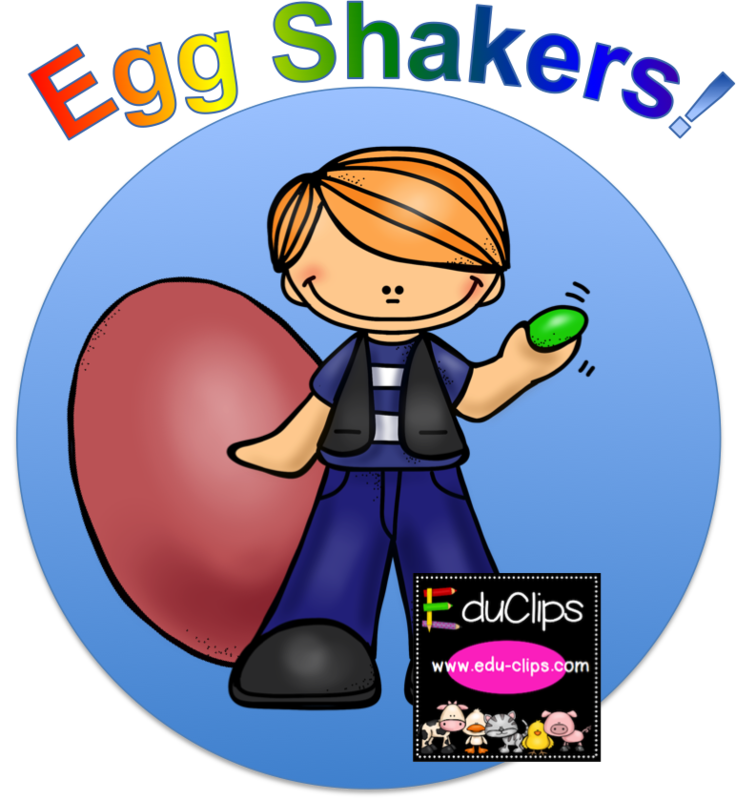 Any song with a steady beat will do for a shaky egg activity. A favorite song is Shakey, Shakey Egg from Music K-8 Magazine. You can listen here. I like this song because there are easy to sing verses, not too many words, and musical interludes that are perfect for shaking. These musical interludes allow me to differentiate the activity based on the age of the students. Of course, the younger students, kindergarteners, get to shake away free-style! With my 1st & 2nd graders, I set up a pattern of echo the rhythm pattern where I play a 4-beat pattern and the students echo. For 3rd & 4th grade students, I created a PowerPoint displaying the familiar 4-beat rhythm patterns to read & shake during each interlude. 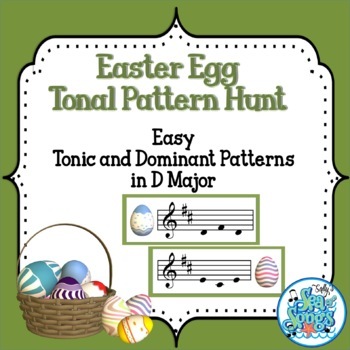 My older students will be going Easter Egg Tonal Pattern Hunting. We have already practiced identifying the function of tonic and dominant patterns that we hear. I created this set of D Major tonic and dominant patterns to provide a visual representation of those familiar patterns and give me the option of making a game out of our practice. The large practice patterns can be printed and used as flash cards, or displayed on your IWB. One slide contains all eight of the patterns. This allows me to displaying all the patterns on the SmartBoard at the same time, and have a practice game while the children are seated in a more controlled manner. When it is time to go on a pattern hunt, I spread the printed pattern cards around the room, either by hanging on the walls or by laying them on the floor in the center of our circle. Students who are "it" will search for the printed pattern to match the pattern that I sing. 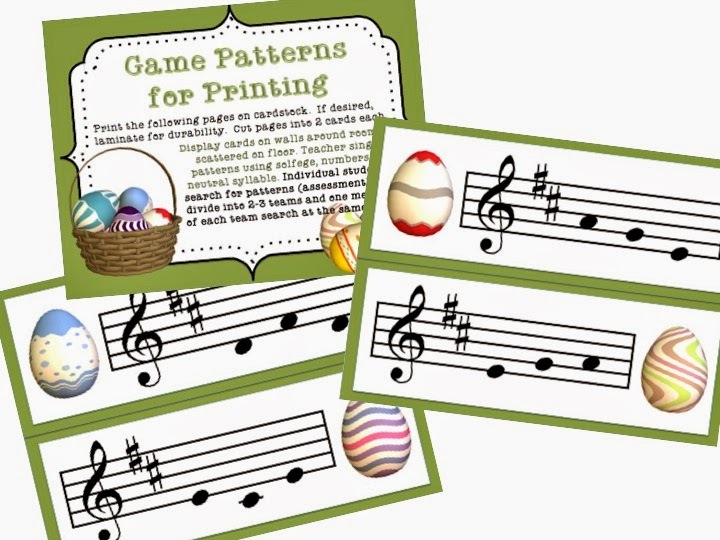 This year, I wanted to do some center activities, so I created some Write the Room worksheets to go along with the Easter Egg Tonal Pattern Hunt cards. I will be placing 4 cards in each center, along with the appropriate worksheet. Students will practice their music notation writing, and of course singing the tonal patterns as they write. This activity will have the most success if students are experienced with singing tonal patterns. If your students don't have too much experience, even an introductory activity, echo-singing through the patterns as they are displayed on your IWB will be helpful. Check out some other great spring music activities at Sing, Play, Creatively. Basketball in the Music Room? Yes! Spring fever has already been diagnosed at most schools, especially here in the south where the sun is shining and temps are already rising. Active planning is important for keeping little minds and bodies engaged in music making. Here are some suggestions for keeping kids actively making music, using a basketball theme. These ideas are perfect for this time of year when the college basketball teams are racing to the Final Four, as well as any time that you need a "hook" to keep kids engaged. Every rehearsal begins with a warm-up, but that doesn't mean it has to be the same every week! 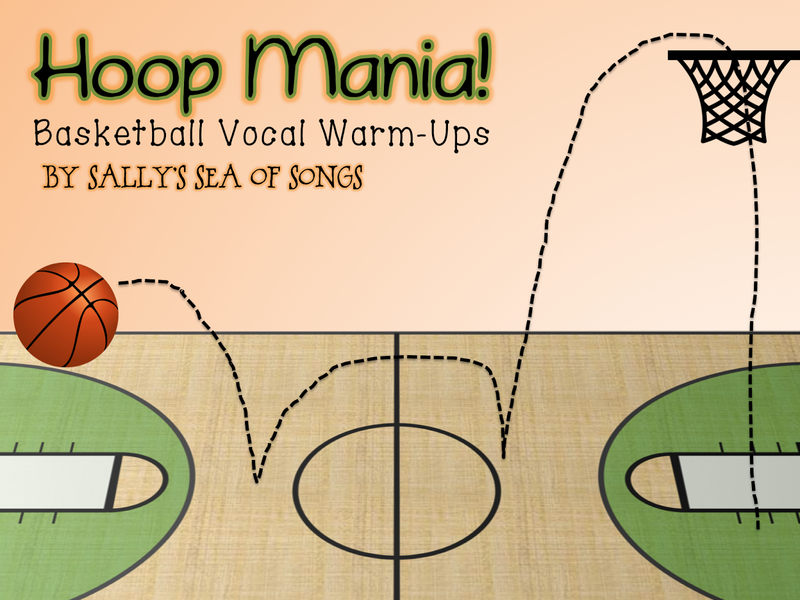 These animated basketball themed warm-ups are great at the beginning of class to encourage singers to use their head voices. They can be used as vocal sirens for younger students. 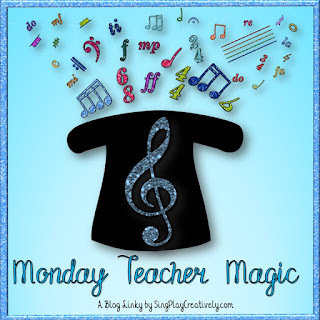 Many teachers prefer to use more traditional vocal warm-ups with older elementary students, and these animations will even have suggestions for specific pitches to sing. Click the Hoops Mania picture above to find this product in my Teachers Pay Teachers store. Have a SmartBoard or other brand of interactive whiteboard? Here's a quick freebie! Right click on the picture below to download, then insert this pic into your IWB software. 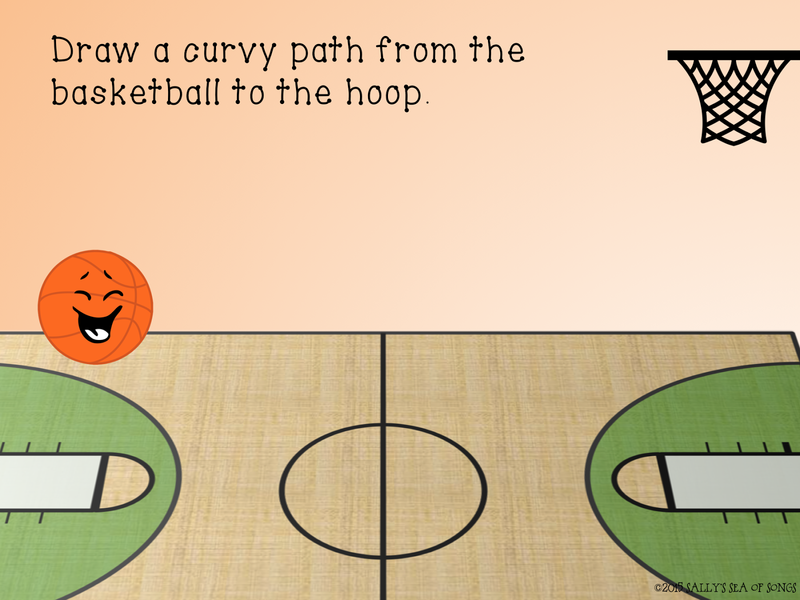 Use a creative pen, or add a basketball from your clip art gallery, and your students can create their own Hoop Mania vocal pathways. Music lessons certainly don't have to stop in order to play basketball! 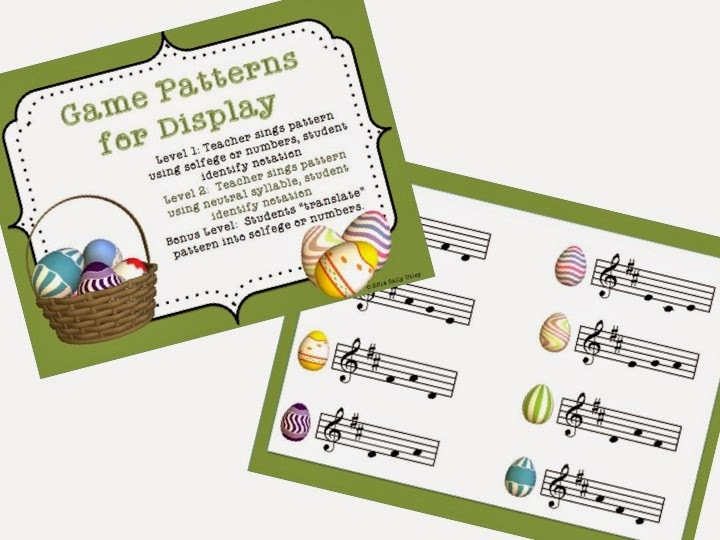 Display familiar melodic patterns on flash cards or on an interactive whiteboard. 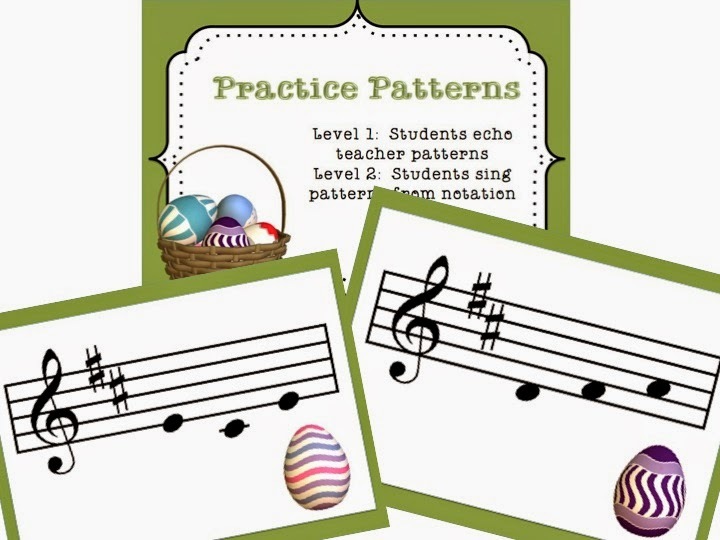 Students can sing patterns with solfege, or play them on recorder or other melody instrument. Keep score like a basketball game, two points for each correct performance. If you don't want to use teams of students, then set up the game so that students compete against the teacher. If they sing/play the pattern correctly, they get the points. If they miss it, they the teacher gets the points! 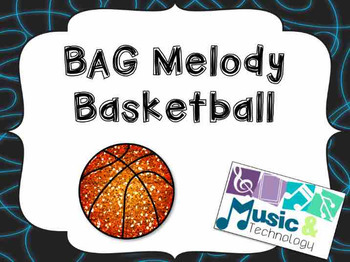 Music and Technology has several sets of Melody Basketball that will give your students a review of recorder notes B-A-G.
Another great way to join basketball & music is to use real bouncing basketballs to practice rhythm patterns. First, you will have to gather the basketballs! Display familiar rhythm patterns on flash cards or on an interactive whiteboard. Put on some fun music and bounce basketballs (or tennis balls if you don't have much room) to match the pattern on display. How will you pass out and collect the basketballs? What is the signal that lets students know that they must stop NOW? If you have to share basketballs, how will you ensure that each child gets a turn? Perhaps you could set up a formation like the basketball players use to warm up. Check with your PE teacher for some ideas. What should a student do if he/she loses control of the basketball? Thinking about this activity from start to finish will help you develop procedures for a smooth, stress-free class! 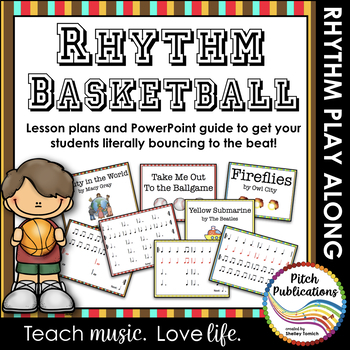 Pitch Publications has several great sets to get you started with Rhythm Basketball. These sets have self-advancing slides set to fun music. Use the basketball to help students FEEL the difference in note durations. This can be as simple as putting on some fun music, and the teacher calling out different durations, like half notes or quarter notes, or calling out different beat functions like macrobeats and microbeats. Students bounce their basketballs to match. It won't take them long to discover that those eighth notes have to be bounced closer to the ground than the half notes! From warm-ups to rhythm and melody practice to bouncing steady beats, basketball and music lessons certainly DO go together! Have you taught any other creative music lessons using basketballs? Let me know in the comments!